Courts of Equity or Not? The Wisconsin Court of Appeals intermittently tells us that it is primarily an error-correcting court. Meyer v. Meyer, 2000 WI App 12, par. 23. Recently, however, the court couldn’t resist the temptation to depart from that primary role to make a little new law, in Randy A.J. v. Norma I.J., No. 02-0469, (Nov. 13, 2002) (recommended for publication). In the case, Norma gave birth to a child while married to Randy. Genetic tests, not ordered by the court, proved that Brendan was really the biological father. The District II appellate court upheld the ruling by Waukesha County Circuit Court Judge Lee S. Dreyfus Jr. that Randy should be adjudicated the father and granted custody, but on radically different grounds than those utilized by the trial court. 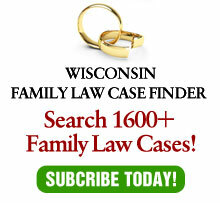 Whereas the trial court used statutes to support its conclusion, the appeals court, in a decision by Judge Richard S. Brown, found the statutes not to be applicable and instead ruled on the basis of “equitable parenting”, a concept nowhere mentioned in Wisconsin statutes. At the outset, let me state that my concern with the Court of Appeals’ decision is not with its results. Where a man has served for all intent and purposes as a child’s father, with the exception of contributing DNA, the psychological parent-child bond is — and should be — far stronger than any biological bonds. After all, the law recognizes and protects a family that adopts children identically as a family that creates children biologically. By the same token, as both the trial court and the court of appeals decided, Randy deserves recognition as the child’s father rather than the man who contributed DNA, but had little, if any, relationship with the child. The issue I raise is the methodology adopted by the Court of Appeals. Whereas the trial court attempted — incorrectly according to the appellate court — to ground its findings in statutes, the appellate court invented a new doctrine called “equitable parenting”. As this doctrine has never been recognized in Wisconsin, the Court of Appeals quoted extensively from a Michigan Court of Appeals case. This is not the first time a Wisconsin court has fashioned an equitable remedy after being unable to find a statutory basis for its order. See In re Custody of H.S.H-K, 193 Wis. 2d 649, 533 N.W.2d 419 (1995). In that case, the Supreme Court held that courts have jurisdiction in equity to act in the best interests of a child to order visitation where a person has a parent-like relationship with a child and a significant triggering event justifies state intervention. As another example, in Rotter v. Rotter, 80 Wis. 2d 56, 257 N.W.2d 861 (1977), the Supreme Court held that a trial court has broad powers to enforce its judgment. The court held that a trial court can apply any remedy customarily available to courts of equity and appropriate to a particular case. Because there is no common-law jurisdiction over the subject of divorce in Wisconsin, such powers that Wisconsin Courts possess in this area are ‘entirely dependent on legislative authority…’ Groh v. Groh, 110 Wis. 2d 117, 122, 327 N.W.2d 655, 658 (1983)… Thus…’courts have no power in awarding custody of minor children other than that provided by statute.’ Schwantes v. Schwantes, 121 Wis. 2d 607, 622, 360 N.W.2d 69, 76 (Ct. App. 1984). This contradiction cannot be reconciled by the issues involved, as both Koeller and H.S.H-.K. involved child-related issues and the other cases involved financial issues. The contradiction cannot be ascribed to court being result-oriented, either. While the preferable result could arguably explain the results in both H.S.H.-K. and Randy A.J., it is difficult to reconcile that theory with the result in other cases. For example, in Lang v. Lang, 161 Wis. 2d 210, 467 N.W.2d 772 (1991), the Supreme Court read the legislative definition of property excluded from division so hyper-technically that it held that life insurance proceeds and property acquired by the termination of joint tenancy due to death were not inheritances and thus were not excluded property. This result was so absurd that it was promptly corrected by the legislature. Certainly, an application of equitable principles would have resulted in a different holding. Yet, the court chose not to apply equitable principles, but rather to restrict the discretion of trial courts to a strict reading of applicable statutes. As a result, family law practitioners, judges and litigants are left with an irreconcilable conflict between various appellate cases. Given my choice, I prefer the “courts of equity” line of cases, as such a rule would not handcuff the trial courts to rule contrary to what may be fair in an individual case. Still, my preference for one line of authority over another is less important than my preference for simply one line of authority. To ignore other case holdings leads to only to confusion and disarray in the law.